Editor's Note: The heart and soul of Holl & Lane is and will always be the stories that we tell. The true life stories from real people. So naturally, we're drawn to other projects that are similar in nature to ours. We love hearing these stories being told in new and exciting ways. 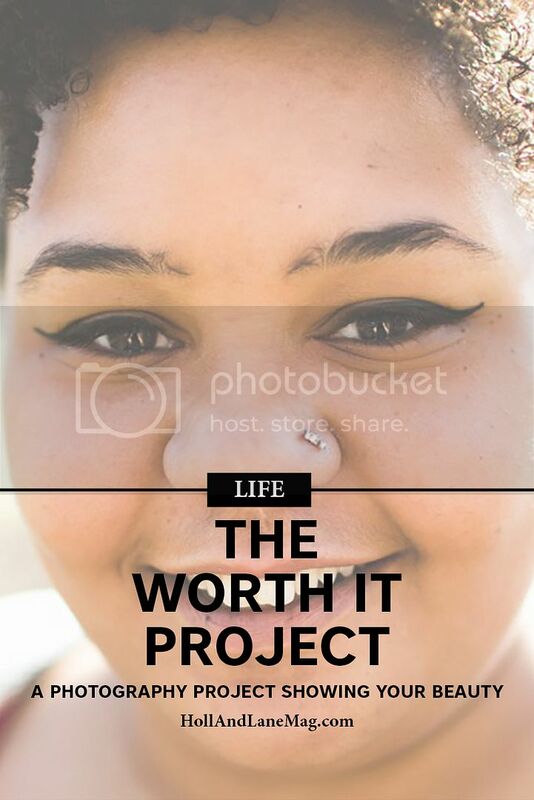 Finding Genesis Geiger's "Worth It" project was eye opening for us. We love the way she captures her subjects through her beautiful photos and allows them to just speak their truths. Before I started this project I was feeling creatively stuck, you know, I wasn't feeling like what I was doing in my work had any meaning. I had ran into an individual who I met a couple weeks back when I first moved to Cincinnati and we chatted for a bit about some of the work he was doing in the area of Domestic Violence awareness. I mentioned that I could give some insight as to what it's like growing up in an environment like that and this person said "Oh, I totally assumed that you were raised in a pretty normal family..." and let me just say, that couldn't be further from the truth! I went home after that conversation and realized that if I hadn't bumped into this person, been given the time to actually share a little about my story...he would've only had his assumptions about me and who I was for the rest of his life. How lame is that? People and their stories matter and they are worth our time. When this project first came to my mind I was hesitant. How could I possibly capture "who" someone is in a matter of minutes or sometimes seconds? Would people care about what I find...what if they think I am being intrusive? I had a lot of reservations, but needless to say, all I could hear was "it's not about you." This project would be about them, about people, real and raw. Once I started, I couldn't help but see how important this was, not just for me, but for all the individuals I was meeting. Many of them shy, reserved and hesitant to share about themselves, I have slowly started to see how in need and hungry humanity is for, well, humanity! Yes, there are individuals in this world who make you feel uncomfortable, vulnerable, on edge, scared even...but take a quick second to think about that. Do they "make" you feel that or is it your assumptions about who they are and where they've been that makes you feel that way? Hey, I've done it, I've avoided the conversation on the elevator, the bus, the grocery line, gas station or even the occasional sitting room in a hospital...but it was never because some individual "did" something per say, but rather because I assumed they were x, y, and z. After meeting some of these random and real people on the streets, in the cafe's, hospitals, and grocery lines... I have come to find that people, no matter what they look like, smell like or dress like - everyone loves to be heard and enjoys being seen, as we should be, what we have been through and who we are as individuals. It has all happened and is for a purpose. And I'll be a monkey's uncle if anyone would ever think that who they are and the things they've lived through are not worth it...because I believe they are. I am a homeless veteran. I served my country for 10 years before I was dishonorably discharged….that makes me different I guess, than every other veteran I know. People assume that I panhandle because I have a choice. Sometimes, I wish people would just ask me what got me here instead of assuming that they know. I don’t think panhandling for a living is a choice, but who am I, right? I tend to not ask people what their assumptions are about me. I already have so many of my own about myself that I just try not ask. I’m my worst enemy when it comes to that, I think everyone has the potential to either be their own best friend or worst enemy. I tend to be my worst enemy.